With so many vendors throwing around the word “analytics,” what does that mean for network management? 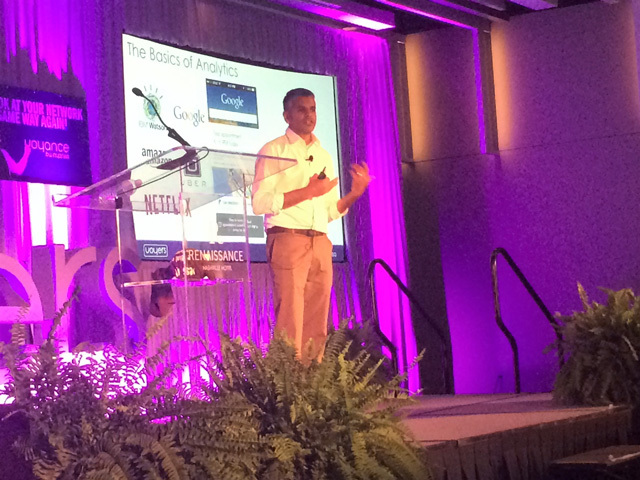 Nyansa chief technology officer Anand Srinivas tackled that question at its Voyers conference in Nashville, Tenn., recently, where customers from Uber, Mulesoft, Mission Health, Wesleyan University and others talked about their experiences with its network analytics product Voyance. He pointed to companies such as Netflix, Google and Amazon as the ones who have successfully shown analytics’ ability to provide useful information, insights and recommendations to customers. When you look at the network, there’s a lot of data in there, he pointed out — packet data, synthetic tests, data from wireless LAN, real-time data from wireless controllers, syslog data, NetFlow data, things like traceroute as well as data from the application side — the issue is how that data is used. Products that offer synthetic testing, EMS/NMS, NetFlow collectors or DPI engines provide basic information in graphs and charts and call that analytics, he said. You can set thresholds and set alerts, but “It’s pretty clear that monitoring at the basic level is not analytics. It’s not taking data and injecting value or time-saving or insight into your work,” he said. More advanced offerings, such as Airway, Prime and Splunk, offer features such as heat maps or the ability to sort and search logs, but still don’t compare to the insights provided by the recommendation engines of Google or Netflix. I have a question: What is Skype for Business user experience like in building X? An analytics platform should be able to take the requisite data sources for that, such as APIs and WAN data, and correlate an answer to that. It could be a complex question such as “What is my DNS performance on VLAN 10?” that requires more than basic, raw data. In cases where you don’t have a question, its recommendation engine should you tell you where to start and ways to be proactive. It should offer the most interesting and actionable things for you. “We categorize it as ‘What’s the bang for your buck for taking this action and where should you take this action,’” he said. The third aspect is the ability to provide feedback. Netflix, for instance, has the star system. You should be able to tell the system that the information it provided was not useful. Nyansa provides a baseline where you should be able to quickly tell if changes made a difference. CEO and co-founder Abe Ankumah founded the company in 2013 with Srinivas and Daniel Kan, now vice president of engineering. Nyansa (“knee-ann sah”) is a word from the Akan language spoken in Ghana that means wisdom from learning. Ankumah said the company grew out of interactions with customers when he worked for Aruba Networks and Meraki. Gartner recently pegged the network performance monitoring and diagnostics (NPMD) market at $2.1 billion, growing at a 15.9 percent compound annual growth rate (CAGR). Cloud workloads, heterogeneous devices and IoT create particular challenges, however. Nyansa is focused solely on user experience, though questions emerged at the conference about whether it will evolve into configuration management or a tool for SecOps teams can use as well. Customer demand will determine those things, Ankumah said. “You’ve seen innovation on the device side and the application side, but the thing in the middle that connects them, not so much,” Ankumah said in an interview. The company provides what it calls a “cloud-sourced” approach to helping customers solve user experience problems in wired and wireless networks, applications or client devices. It uses a crawler or probe on the network that can be a virtual machine or 1RU server. It collects data from multiple sources and sends a low-bit-rate metadata stream to the cloud back end. The company spent a year and a half building its recommendation engine, which employs supervised machine learning, using components such as Cassandra, Apache Spark and Elasticsearch. The system establishes baseline performance on each device — at universities that can be thousands of student and faculty devices — and an overall baseline for the whole environment. Users can look at performance for specific periods of time or call up a specific device to work on a particular user’s problems. At the conference, Wesleyan University deputy CIO Karen Warren talked about how Nyansa’s integration with ServiceNow provides added tools for the help desk. The “cloud-sourcing” enables customers to anonymously compare their performance with other users operating similar network infrastructures. One differentiator is the technology’s ability to help IT departments pin down a cost to certain actions, Ankumah said. He said a big differentiator is Nyansa’s ability to troubleshoot multi-vendor environments and suggested it could enable customers to create digital-twin environments where they could explore what-if scenarios. Andy Garland, IT director for Creative Artists Agency, a Voyance early adopter, called it a great tool for understanding Wi-Fi experience. He said Nyansa had improved the insights from the recommendation engine over time. “It’s really good at identifying trends. You can see what’s going on over time. There’s really no tools out there that do that kind of trending over time,” he said.